The Bad Lads have always been more mischief makers than trouble makers, more scamps than bullies. That is until older boy Joe takes over as gang leader. He has other darker ideas, and though at first Tonto thinks he is pretty cool, he soon becomes weary of him and his shenanigans, especially when he starts targeting old Mr Eustace. 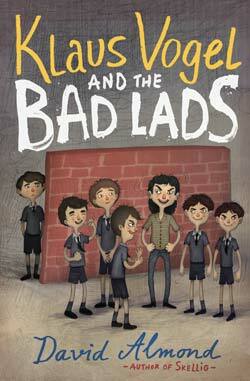 When Klaus Vogel, a refugee from East Germany, arrives in their community, the Bad Lads take him under their wing. They think they will be making a difference to his life, help him “fit in”, but unexpectedly it is him who will put his stamp on theirs. Though timeless in its themes of bullying and intimidation within communities, Klaus Vogel and the Bad Lads also holds a very strong sense of time and place. The poverty of post-World War II Tyneside, the community spirit but also the ingrained prejudice, particularly towards conscientious objectors are portrayed in a powerful and evocative manner. It is a compelling tale about standing up to ignorance and prejudice, and is especially moving because of Klaus’ character and his background. Klaus knows very well the price one has to pay for freedom; freedom of movement, but also freedom of thinking and is akin to Mr Eustace for this reason. Almond describes the Tyneside of his childhood with much passion and the atmospheric artwork makes this short tale all the more ominous. Both team up to create a highly unusual tale, which is primarily aimed at reluctant teen readers but will have much more widespread appeal.